On Monday, December 13, 2010, the opening ceremony of the exhibition „My Dream about Afghanistan“ took place in the lobby of the House of Representatives of the Parliament of the Czech Republic. Minister of Defence, H.E. 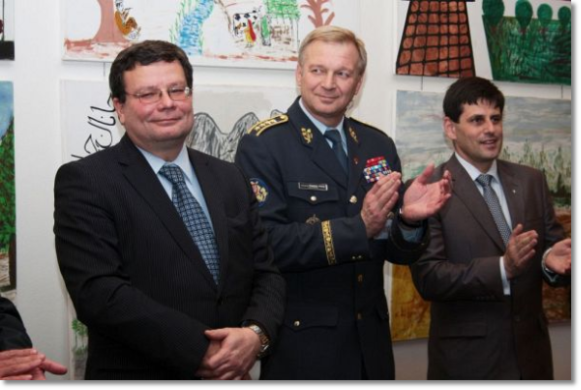 Mr. Alexandr Vondra and Member of the Parliament Mr. František Bublan had the patronage over the exhibition. During their stay in Logar, soldiers of the 5 contingent of the Army of the Czech Republic and its Provincial Reconstruction Team organised a painting exhibition of 18 schools of 5 districts of the Logar province. Centipede, Ministry of Education of Logar province, Ministry of Foreign Affairs of the Czech Republic and Czech schools and parishes contributed to the organisation of the exhibition as well. The young painters were about to paint pictures for their Czech friends… the topic was “My family”, “My village” and “My school”. Many beautiful works were sent; pictures that show life in Afghan families, friendship and the countryside of Afghanistan. On the other side, Czech, Slovak and American children tried to show their wishes for their Afghan friends. About 80 Centipede teachers took part in the opening ceremony. Significant guests were present too – Minister of Defence H.E. Mr. Alexander Vondra, Chief of the General Staff of the Army of the Czech Republic Army General Vlastimil Picek, Deputy Minister of Defence Mr. Michael Hrbata and long-term Centipede friends Gen. Josef Šíba, Gen. Michal Pažúr, Col. of the General Staff Rudolf Honzák, Mjr. Karel Kout and the Envoy of the Ministry of Foreign Affairs for Afghanistan Ester Lauferová. Members of the CIMIC group who were the main Centipede coo-workers and were able to realise common projects of the Centipede and the 5 contingent of the Czech Army were present too, of course. In her speech, Mrs. Bìla thanked to everybody of the 5 contingent who contributed to the Centipede assistance in the Logar province for their fantastic work that could bring so much to theAfghan children. One of the respected guests, H.E. Mr. Mohammed Kabir Farari, the Ambassador of Afghanistan to the Czech Republic, thanked to the Czech Republic and its Army for everything it was doing for Afghanistan. Col. Honzák, who was in charge of the 5 contingent, pointed out the gratitude of the Afghan people of the Logar province for every single event and project. He reminded the importance of the exhibition and its awarding ceremony to the Afghan participants and their families. For the first time, the Afghan men brought their wives and daughters to a public event like this. Minister Vondra joined the speakers, telling that he had the chance to learn about the wonderful work of the soldiers of both military and civil teams. He also reminded that during their trip to Logar, Minister Vondra and Mrs. Bìla signed a memorandum about further cooperation of the Czech Army and the Centipede. In his speech he stated that the Centipede keeps on giving the troops of the Czech Army abroad human touch.